Marion Foreman has been a nurse for nearly 50 years and is a personal trainer. 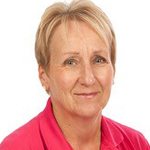 She has worked across many areas in the NHS and now focusses on helping frail older people and people on their cancer journey to exercise safely and effectively. She is passionate about encouraging people to make the most of their health and wellbeing and to do the best they can to remain active.